Homemade Pedicure — Combine 1/2 cup Epsom salt and warm soapy water, then soak your feet for 5 minutes to soften skin. Facial scrub — Mix 1/2 tsp of Epsom salt with your favorite cleanser or lotion; massage into skin using small circles to give your pores a deep-cleaning. Rinse your face with cool water, pat dry. I have mixed it with Udderly smooth lotion before and it works amazingly! Wash Pots and Pans —Place a small amount of Epsom salts into those really-dirty dishes before you scrub them. 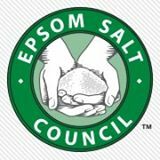 Epsom salt has an abrasive texture that helps to removed caked on food. Clean your washing machine — Washers can have built up gunk, detergent and who knows what. This is perfect for top loaders, no sure on front loaders...but add a quart of clear vinegar and one cup of Epsom salts to your washer that is full of hot water. Let the solution soak for about an hour then continue wash cycle!